Violet the Cannibal is probably one of the hardest working female drummers in the UK. She has worked with many bands including top tribute bands supporting major acts touring throughout Europe, UK, US and South America, including many major Festivals. Initially taught by Dave Mackingtosh from Dragonforce. She has also worked with legendary Punk band Vice Squad. Violet also toured for two years solid with American guitar legend Adam Bomb, wowing audiences with fireworks and flames. No one plays as many shows clocking up over 250 a year. 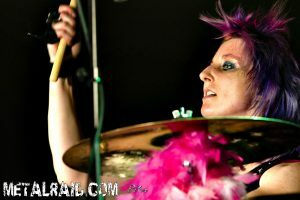 She is also the first female drummer to be featured on two tracks for the Xbox game, Rock Band. 2016 -2014 Sessions also include: – The Speak, Kam Singh, Endless Nirvana, Paul Roland, Joe Jammer, Australian band The Red Paintings, Scuzz and Kerrang favourites, all girl band – The Kut – Alexa de Strange, Louise Distras and Aerosmith Tribute, The Toxic Twins. 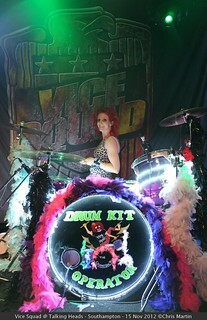 She is a drummer with extensive musical experience playing in bands for over 10 years, initially. Playing all styles but with preference for rock/pop/punk. A wealth of experience playing live and studio work to a click. She has played on tracks that have been aired worldwide on radio and television. Between 2005 – 2008 she played over 850 shows. With German rockers Uniting the Elements. Uniting the Elements, were at the time UK’s hardest working rock band playing over 850 concerts in 3 years. UTE had National Press, Radio and online Fanzine coverage. Played alongside such notables as: Roachford, Peter Hook and The Light, The Christians, Dodgy, Devildriver, Cherie Currie, The Selecter, Girlschool, Bad Manners, The Dickies, Killing Joke, The Damned,The Ruts DC, 999, The Adicts, Fucked Up, Cockney Rejects, Jello Biafra, GBH, Vince Ray, Discharge,The Business, The Exploited, Texas Terri Bomb, Undertones, Nevile Staple, Rancid, UK Subs, Behemoth, Cocksparrer, Anti Knowhere League,PIL, Fabio and Grooverider, From The Jam, AWOLNATION, Young Guns, Marty Friedman, Peaches, SHAM 69, Bug Girl, Live/Wire, Misfits, Jethro Tull, Louise Distras, Toy Dolls, Bryan Adams, The Scorpions, Thunder, The Levellers, The Fun Lovin Criminals, Limehouse Lizzy, Dr Feelgood, Blackfoot, Hazel O’Connor, Deborah Bonham, Wishbone Ash, Wayne Hussey, Nine Below Nero, Austrailian Pink Floyd, The Orb, Fuzzbox, Uriah Heep, The Hedrons, Betty, The Cliks, The Sweet, Therapy, Marky Ramone, The Alarm, The Blockheads, New Model Army, Sandi Thom, Eddie And The Hotrods, The Yardbirds, GMT, The Sensational Alex Harvey Band, Pat Savage Band, Michael Schenker Group, Saor Patrol The Peatbog Faeries, Eat Static, Hawkwind, The Proclaimers, Hayseed Dixie, I Am Kloot, The Rezillos, Beyond Reason, The Beat and The Animals, Mohair,The Glitterati, Joan Ov Arc, Blackwire, Die So Fluid, Planet Of Women, The Organ, E2K, JJ72 The Cut Outs, Greymatter, Killerpilze, Jim Jones Revue, Molly Hachet, Joe Cocker, Rikkha, to name a few.